I learned in my early years of gardening (and life in general) that if you wait for perfect conditions, you’ll never get anything done. In spite of learning it early on — I still have to remind myself of that almost everyday. And especially in the heat of August and sometimes September when I’m trying to start fall crops and it’s dry as a bone in my garden. Observe animals or insects. Take the ant for example. They don’t get upset like we do about problems — they just pitch in and start working on them. The difficulties of the work, the size and complexity of the job don’t intimidate them. They just look for the next step and do it. Consistency is what they have going for them and in most cases it gets the task accomplished. It’s taken me all my life — but I’ve tried to adapt this attitude. I’m not always successful, but I remind myself all the time and keep on working anyway. At the end of July we had few brief rains. They just barely wet the garden beds I wanted to plant cover crops in, but I planted — put some straw on them — and believe it or not they came up. I planted beans numerous times. I planted only about a 3 x 3 section each time. The first planting — only two beans germinated. Fortunately they were Masai and will give me lots of beans — and are now in bloom. The second planting never came up. The 3rd, 4th, & 5th plantings did. Two butter bean plantings — nothing germinated. Planted in cell packs. Transplanted to the garden last week. Have lost a few, but I think I’ll get butter beans. Planted radishes in a flat. Transplanted to the garden the other day. Crickets have eaten all but two. I’ll plant more in another flat tomorrow. Those little tiny pepper plants that haven’t had enough rain this year are growing tall in spite of conditions and are setting fruit in abundance. I’ve started 3 varieties of lettuce so far in flat and it’s all up about one inch. I’m going to let it grow a bit more and hope for rain before I transplant to the garden. After loosing 16 squash plants, I finally have some great looking squash and minimum of squash bugs. (Can hardly believe it!) The plants are gorgeous but I’m having trouble with pollination. I’m trying to hand pollinate, but so far I haven’t had male and female blossoms open at the same time. Squash plants at last! Now to get squash. It’s tempting — as it is every year — to pull some things up when they don’t look good and are not giving fruit in August and September. But like everything — it will all change. And I know from past years that when the soaking rain finally comes — the fall garden can be as wonderful as the spring garden. You never know what will be successful. You just have to give it a chance — and plant now even in less than perfect conditions — so you can reap later. A thought hit me when I read you blog today. You said that your squash male and female are not opening at the same time. What would happen if you took a Qtip and got male pollen on it and placed it a container, maybe an empty sterilized medicine bottle for example and then when the female opens use it. 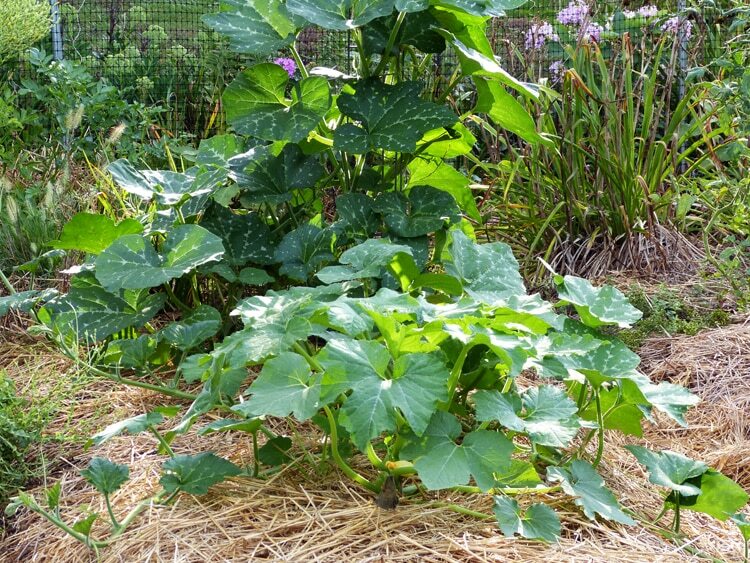 It was a thought and since I lost all of my squash to the dreaded squash bugs and drought I can’t try it this year but maybe you can and tell me if it works. It was just a thought. I pray your winter garden is a hugh success. Also, I hope you had already read my post on the end of the year strategy for squash bugs. It’s very important for next year that you kill everyone you possibly can this year. Otherwise — they’ll stay to haunt you. I sure appreciate your thoughtfulness in putting this comment up, Patricia. Two heads are always better than one and I always welcome suggestions. What a welcomed comment Alice! You inspire me too! Sometimes the task at hand seems so overwhelming — but if we do as you did — and just continue to take steps in the direction we want to go — it all gets done. Great fun gardening with you Alice! And Congratulations on the great harvest! Job well done! I can relate to Alice, this seems like such a busy time, and it’s hard to find a clear spot to begin, but I will now be thinking like an ant, and will take the first step – TODAY. Most inspiring and encouraging post, Theresa. Great! Thanks Sandra for letting me know.